Have you found an online vendor selling Santa Teresa 1796? Santa Teresa 1796 rum is produced in Venezuela and aged using the solera system that blends rums aged between 4 and 35 years. Before bottling, the rum is aged for a further year in large French oak casks to marry the blends. This rum was first created in 1996 to celebrate the 200th anniversary of the establishment of the distillery, the Santa Teresa Hacienda. This is probably one of the most underrated rums I've tried besides the Ron Centenario 20-Year. Smells and tastes of caramel, butterscotch, molasses, honey, vanilla, and a light oak. This is exactly the type of rum I love. It's especially good for the low price of only $39.99 (K&L Wines). Santa Teresa 1796 is my first rum love. It has a perfect balance of spice that lingers. Slight hints of molasses and nutmeg with a little oak. Everything u want from a rum. The smell, after taste and smooth. Subtle flavours you notice after every glass.There is a very whiskey feel to this rum. A go to when you want to relax. Nice dark leather color with pastry notes with caramel, honey, toffee, butterscotch. Same notes in mouth added with chocolate. Smooth, very short, no aftertaste. A little disappointed but for the price, it's ok. I just tried with a drop of water and other fragrances are emerging, perhaps on ice. This rum is outstanding as both a sipper or mixed. It's pleasant, accommodating, flexible and delicious. Perhaps more of a generalist in it's applicability, if I had to settle on having only one rum, this would be it. Pleasant aroma. Sipping some proved to be interesting. Definitely a complex series of flavors and I don't claim to be anywhere near an expert but there is a distinct sweetness and some fruitiness to it. Gives a good burn but it not harsh nor overpowering. This would be excellent as a mixer as long as the ingredients used are not overpowering. This rum needs complimentary flavors that are subtle. This is one smooth rum without any cloying sweetness or added flavorings. It's a perfect straight-up sipping rum, one of the best in the $50 US category. Excellent. Schönes helles Bernstein im Glas. In der Nase sind Harz und Holz sehr präsent, gefolgt von Zitrusfrüchten und frischem Gras. Im Gaumen weich und harmonisch, kandierte Früchte, leichte Nuancen von Vanille, Kakau und Holz. Im Abgang etwas Alkoholschärfe mit Schokolade und Holz. Nice light amber in the glass. In the nose, resin and wood are very present, followed by citrus fruits and fresh grass. On the palate soft and harmonious, candied fruits, slight nuances of vanilla, cacao and wood. In the finish some alcohol sharpness with chocolate and wood. O tomto Venezuelskom rume som počul, že je dobrý. Po malej degustácii by som povedal, že je viac ako len dobrý. A to po všetkých stránkach. Pekná tmavo zlatá farba naznačuje, že zrel vo vypálených sudoch. Po prvom privoňaní medové plásty, pražené oriešky, karamel. Príjemná sladkastá vôňa. Rum je s peknou viskozitou, pomaly steká po stenách pohára. Na prvý pocit na jazyku sladký, chuť postupne prejde do jemne drevitej, lemovanej sušeným ovocím a hrozienkami. Je veľmi jemný so stredne dlhou dochuťou. Povedal by som, že je sladký tak akurát, ak nie trošku menej. Celkovo kvalitný a chutný rum nielen pre začiatočníkov, ale aj pre pokročilých rumových nadšencov. Určite každému odporúčam, nakoľko v tejto cenovej relácii (niečo cez 30€) je veľmi veľa oveľa horších rumov. What a good surprise was it to test this rum! It has a light but nice orange color. The nose is very sweet with hints of vanilla, caramel and oak. In the mouth it is very delightful, it feels sweet but just enough, with aromas of vanilla, baking spice, and even maybe a tiny bit ofor chocolate. Vlajková loď venezuelské firmy Santa Teresa. Na trhu je od roku 1996. Pod názvem 1796 Ron Antiguo de Solera byla představena u příležitosti dvoustého výročí Hacienda de Santa Teresa. Už z názvu je jasné, že zrání probíhá metodou solera. Jedná se o směs rumů starých 4 až 35 let. Ochutnal jsem 1/3 lahve při rumovo-doutníkové párty s kamarády z práce, jeden vzorek pro kontrolu degustuju ještě teď při psaní. Shrnutí: Na tento rum jsem si zuby brousil několik let, od chvíle , kdy mne poněkud zklamala mladší Santa Teresa a uviděl jsem tuhle lákavou butylku. Jedná se o dobrý rum, kolegům jemností v chuti připomínal Diplomático Reserva Exclusiva. Když budu hodně přísný, tak i přesto, že je to dobrý rum, tak bych vzhledem k ceně čekal ještě nějakou "přidanou hodnotu", když ho bezprostředně porovnám s nedávno představenou prémiovou čtyřkou Arcane-Atlantico-Zaya a Zafra, tak můj dojem je, že jejich kvalit nedosahuje. To ale může být ovlivněno tím, že mám rád výraznější chutě a vůně. while other Venezuelan rums have suffered quality issues (not surprisingly), ST1796 has maintained its credentials as a super, additive-free rum drinker's rum. This rum suprised me, it has strong body, qualite alcohol tail, strong aroma, still you can find smoothness in the taste. Great rum and very easy to drink neat. Lots of Carmel notes and light oak. An incredible rum for a reasonable price - really smooth and easy to sip straight or on ice. Loved it! I am new to the world of aged Rums and must add that I like to sip on aged Rum rather than mixing it. 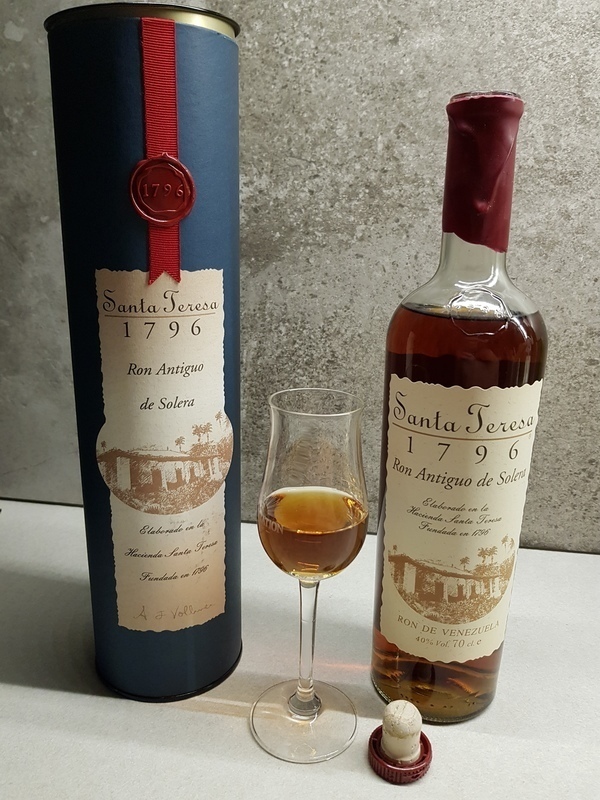 I recently purchased a bottle of Santa Teresa 1796 Rum from our local Liquor outlet. Having minimal experience with Rums I was pleasantly surprised at the profile of this Rum, which was not at all what I had expected. The aroma was sweet with flavours of molasses, butterscotch as well as oak being detected. In the mouth this Rum, while sweeter than my previous tasting with St. Nicholas Abbey Rums, but not overly sweet and was very flavourful. A nice sipper Rum to add to my collection and, best of all, it is very affordable. ST 1976 is similar to Mount Gay Extra Old, but with a little more depth of flavor. With little/no added sugar, this is a solid, dependable, dry sipping rum that's WAY better than its neighbors Diplomatico and Pampero. Recommended neat, or in a Rum Old Fashioned. I hope to revisit this review after further tasting. If you're into dry Rum this might just be the ticket. Personally, I don't like it that much but I can't give it anything below 7 because it is fullbodied & complex. But it is so dry that I find the finish almost Dry Martini-esque. I prefer Rums like El Dorado 15 which have lots of added sugar (but are still well balanced and don't taste like a rum liqueur). 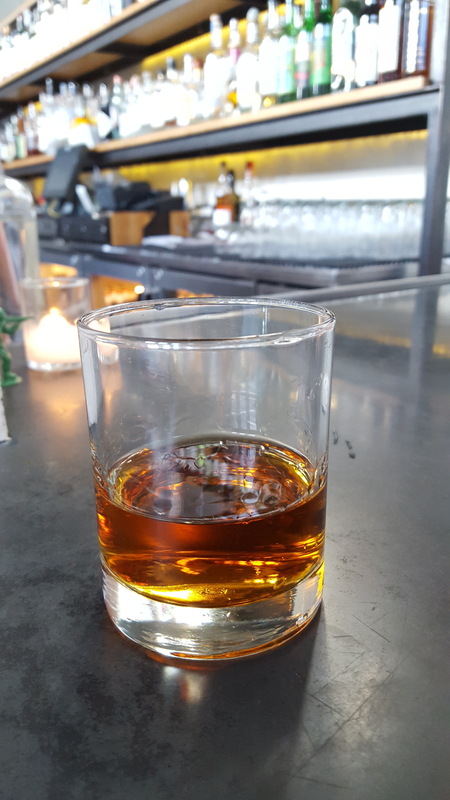 For dry-rum purists who insist that added sugar will 'mask' a Rum's character the Santa Teresa 1796 is perfect. It has a lot to offer but not quite my thing. 'rich sherry, honey, and dried fruit (prunes or apricots).